It is a truth universally acknowledged, but seldom questioned that PR agencies have problems with self-promotion. They will tailor best strategy just for you, they will drive more traffic to your website, build your audience’s trust and provide comprehensive instructions how to goals… but when it comes to their own PR they become the plumber with the leaky tap. Why should PR pros care more about promoting themselves? By talking openly about our accomplishments, we have a greater chance of being remembered and not forgotten. Here are some tips on how to get noticed and influence people. First of all take a look on your website. Content may be the king, but presentation is the crown prince. Having a professional online presence is essential, it is an easy, inexpensive and the minimum of professionalism in most fields. “You can spend all your time beefing up your content and crafting killer offers, but if your prospects aren’t immediately interested in what they see, you’ve got little chance of wooing them with your persuasive content,” stated Peter Boyle on crazyegg.com. If you do have a significant accomplishment in your background, whatever you do, don’t avoid talking about it. I know, we teeter about between talking too little about ourselves or coming across as a flaming narcissist. But no one else will do it for you. Fortunately, some of you understand it and make it even regularly – just take a Michał Sadowski from polish Brand24, who publishes his financial stats on FB and his blog. It strengthens his relationship with his clients and brings the new ones. Every case study is a real-life success story about your products and services. It can be difficult to convey the value of your business to clients. A well-written and well-structured case study is an excellent and cost-effective way to showcase your company’s capabilities and ultimately encourage more clients to work with you. Show your inspiration, ideas and describe how your client has benefitted from your services. It is important to also include what problems you had to struggle with and how you accomplished your goals. Pro tip: It is better when the story is tightly focused on the customer’s experience. Marketing case studies are often too “hard sell” for the media. Once created you can add your case study to your website or send them direct to your prospects. The best format? video, infographic, podcasts or the written word, it’s a good idea to offer at least some of your success stories in different formats. You can combine formats, for example provide a video case study with written content and graphics to support the story. ….. and of course add some. “Content is King” – so they say and some of them even add that it’s the whole kingdom. Content marketing continues to be one of the most important digital trends in 2015 and no wonder, it’s about engaging readers, improving your site’s rankings, generating traffic, leads, and customer loyalty. What should it include? Most of all it has to be solid, substantive and original. What else? Take care about adjusting it to your target group and create engaging and thought provoking content. Use pictures, videos, or diagrams – they can help illustrate your point. Choose different touch points: social media, forum, blog, webinars, reports. Presenting this from a single platform like the Brand Journal enables the whole brand’s communication to be delivered from a single place quickly, simply and reliably. Pro tip: Google likes originality and penalizes sites that copy original content. Copied content can simply crush your bottom line. Not cool. On the other side, websites that create the best content, will be rewarded. Businesses are businesses, and people are people. But it’s the people in your business that affect how others perceive you. This is why it’s so important to show the human face of your company and bring your communication to a new level. 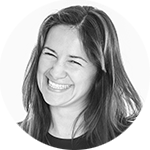 Show off your staff, who’s running marathons, an expert in Polish posters or writes the best linguistic tips ever? Your employees can be the ambassadors of your brand. Consider using Instagram and Pinterest for the same reasons. Is it so complicated? I don’t think so. Take PornHub for example. And it’s “first wearable tech that allows you to love the planet by loving yourself”. Great campaign, snappy slogan and CSR idea behind it. Like always. Remember this notorious action, when PornHub announced one day, that for every 100 video streams viewed in one specific category on the site, they will plant a tree in celebration of Arbor Day? The site was keeping a running tally of how many trees was supposed to be planted. Next afternoon more than 11 000 had already been logged. Well, apparently people on the Internet do love the environment. 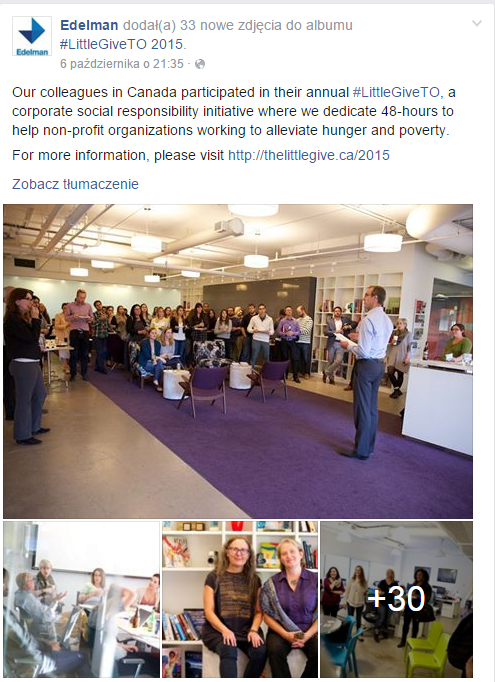 Take a look at the SABRE Award winners for 2015. Most Innovative Agency? Allison+Partners – communication agency. Its’ recent promotion campaign of SXSW next edition (called “Cronut at Midnight” ) amassed nearly 700 million impressions in a single week, showing again how creative and bold the agency could be. With their acquisition of PR Century, the firm’s Asia-Pacific revenue increased by 300%. All because of partnership with Dominique Ansel Bakery. Its’ founder and owner “invented” for that occasion special cronuts and presented his brand new dessert creation: Chocolate Chip Cookie Milk Shots. Before an event he commented: “We are likeminded in our commitment to innovation and what better place to celebrate that spirit than at a festival where some of the most innovative ideas of the last twenty years have been introduced”. After the festival, when the cronut craze hit and people were buying them on eBay for an absurd price 1000$ per pastry, he had to remind publicly: “I’m not sure people realize you can’t refrigerate a cronut. It starts to turn really stale and soggy. And the product simply shouldn’t be outside in an uncontrolled temperature environment”. Another example – last self-promotional stunt made by young independent agency from Europe – Gloryparis – which used the social capital of well-known people to rise above noise. 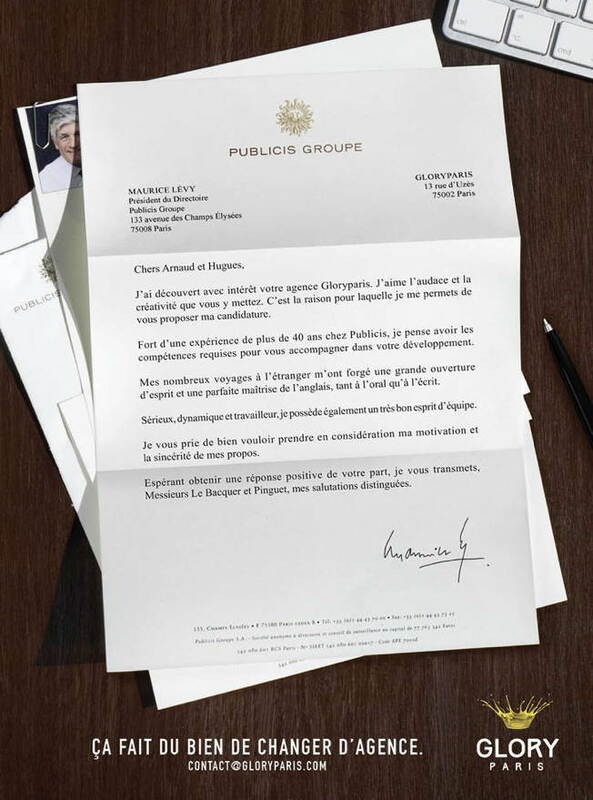 They created a print ad that features a hopeful (fake) cover letter from no other than Maurice Lévy, High King and CEO of Publicis, who pleads for a job at the Paris shop. Cheeky? Yes. You are wondering what the agency’s slogan is? “Audacity brings glory”. Be inspired. Your clients, who are investing in you should be certain that you can take care about your own reputation as well as theirs. We are exposed to hundreds, if not thousands, of marketing messages every day. But we only notice very few of them. Showing, that you are doing really great things and you are heavily involved in your work, is another way of engaging your consumers and attaching them to your brand. If you angle it towards your customer interests, this is even better. 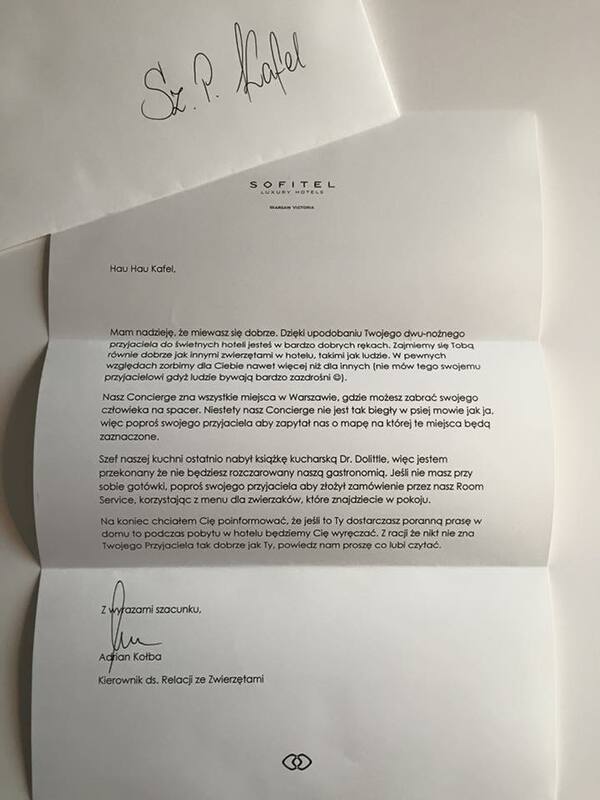 Polish hotel Sofitel understands it very well. One of its’ guests always travels with a dog. At one time he got from room service a letter… addressed to his dog and recommending attractions in the hotel and in the city. The owner of a dog took a photo of this letter and published it on FB. Result? The post has already more than 3 k likes. “I hope you are well. As your two-legged friend has an affinity for the best hotels, you are in good hands now. Rest assured we will take care of you as well as of other animals in this hotel, such as humans. As a matter of fact, we will do even more for you than for others in some respects. (Do not tell your friend; humans can be very envious.) 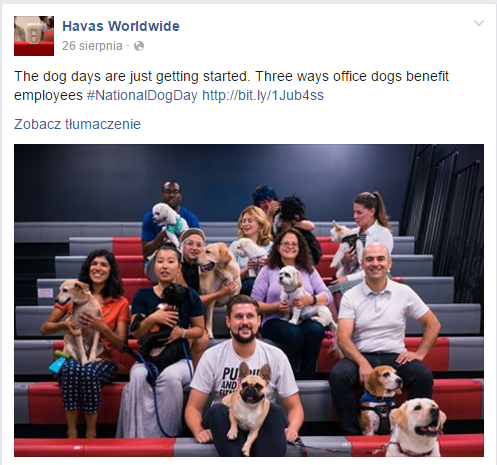 Our Concierge knows all the right places in Warsaw where you could take your human for a walk. Alas, he is not as proficient in dog speak as I am, so please ask your friend to request a map where all those places are marked. As our chef has recently bought Dr. Dolittle’s cookbook, I believe you will not be disappointed with our cuisine. If you have no cash, ask your friend to place your order with our Room Service using the pet menu you will find in the room. Finally, I would like to inform you that if it is you who delivers the morning papers at home every day, we will be more than willing to do that for you during your stay at our hotel. As no one knows your friend as well as you, please let us know what they like to read. Self-promotion is becoming ever more important. Even if you aren’t an entrepreneur – says Communication Consultant Peggy Klaus – you need to think like one and start talking up your most valuable product: you. As PR pros we should be highly skilled in that art. A good example comes from David Ogilvy, father of advertising: “If you can’t advertise yourself, what hope have you of being able to advertise anything else?”.